Eway Bill, which came into effect from 1st April, is to be generated for all movement of goods and covers goods being exported and imported. In our previous blog, we have seen the conditions for import transactions. It should be noted that if exported goods are covered under Rule 138 (14) of CGST Act (E-way Bill Rules) no E-Way Bill is required. In such cases, goods are transported to ICD or CFS or Warehouse from business place of exporter. It should be noted that a maximum of 250 line items can be included for generating Eway Bill. Should your export transaction have items more than 250, then it is recommended to aggregate the items HSN-wise. 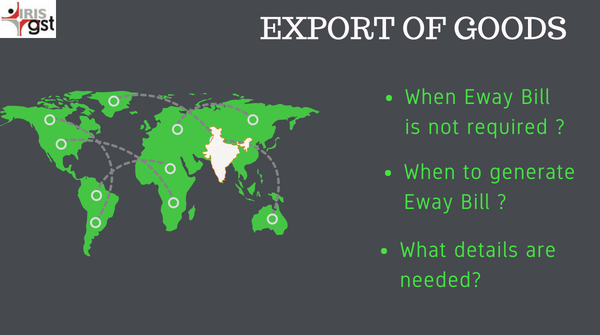 The approximate distance, even in case of export should be derived based on the distance within the country i.e. the consignor place to the place from where the consignment is leaving the country and cleared by Customs. We hope this blog explains the specifics of export transactions. IRIS is an established GST Suvidha Provider (GSP) and was one of the first GSPs to complete the integration with NIC’s E-way Bill System. Our E-way Bill solution, branded as IRIS Topaz, is an end-to-end solution for entire E-way Bill operations. IRIS Topaz can be accessed through the web, desktop utility, and APIs. IRIS Topaz Desktop Utility, an MS® Excel-based application, will enable you to manage all your E-way Bill related tasks simply and quickly. Neena Sethi, a Management Accountant, has been working with IRIS for over 7 years and is currently the Functional Analyst and Subject Matter Expert for IRIS' GST offerings and manages the Eway Bill Offering, IRIS Topaz. She has also been assisting the clients in return filing related queries. Prior to GST, she was involved in compliance and data analysis for the US markets. In her leisure time, she enjoys reading and travelling. export goods are moved from business place to private warehouse for export purpose with export waybill. we will consolidate the cargo country wise and move the cargos to airport for export .kindly confirm whether second eway bill required for this transaction.